Boston: Little, Brown and Company, 1951. First Edition, First Printing, First Issue Jacket. 8vo., 227pp. 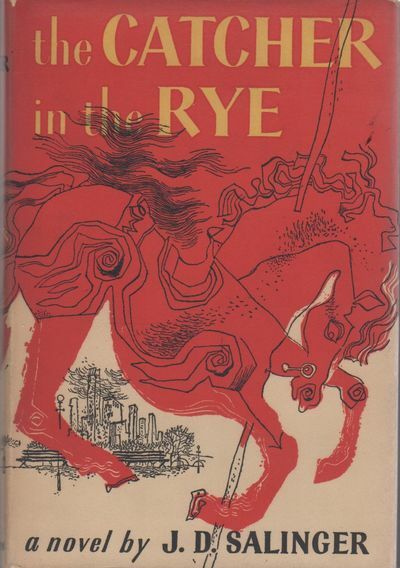 ; VG/VG; spine red and white with black and yellow lettering; dust jacket protected with a mylar covering, price uncut '$3.00'; has all points, including FIRST EDITION stated on the copyright page, black cloth decoratively stamped and lettered in gilt on spine, first issue jacket has Salinger's black-and-white photograph portrait credited to Lotte Jacobi on rear panel (very small, just above author's name. ), dust jacket lacks Book-of-the-Month Club statement on front flap; dust jacket is in amazing condition, with extremely slight wear to corners, tail of spine; text block has some small staining to upper edge; interior clean; LP consignment; shelved case 3, Dupont. Full-priced Rockville.